At about 3am on October 17th Christian George Busche took one last peaceful breath and left this earth leaving behind 99 plus years of a life well lived. He will be remembered in the fall breeze at the hunting shack, during morning coffee chats at the Harshaw cabin, by the smell of diesel fuel and grease , in piles of freshly split wood , with the aroma of a freshly made pot of chili and by the memory of the twinkle in his bright blue eyes. An outgoing and exceptionally handsome man, he was a loving and supportive husband to Joyce for over 72 years. Their years were filled with raising children, socializing with their friends, taking fishing and car trips. Christ always looked out for her best interests and gave her the freedom to develop her own skills and talents. He was also a dedicated father, grandfather and great-grandfather. Whatever he took on he took it on with gusto. When he loved fishing, he fished as much as he could. Early in their marriage Christ and his wife, Joyce, lived in a little cabin on a trout stream. Every day after work he'd grab his rod and head down to the river where he would fish until he was called for dinner. When he learned to golf, he golfed as often as he could and became so proficient that he has 3 Holes in One to his credit. Soon after moving to Duluth, he was introduced to wood carving through a friend’s father. He then learned the craft and thru his life would carve hundreds of diamond willow walking sticks, build furniture and make beautiful handcrafted birdhouses that Joyce would paint. This was a man you could not stop from learning more. A man who taught his children what it meant to be hardworking, honest, fair, caring and compassionate, Christ set a high standard to follow. He never asked anyone to act or be any different than what he expected of himself. He showed his love through hard work and a commitment to provide for his family. Unlike many of his peers, he was a full participant in raising his children: he worried about the kids safety, drove teenagers to school, taught children how to tie their shoes and blew a running nose. Christ loved to cook, and he loved sharing a meal. Early in their marriage, Joyce had to learn to accept Chris's presence in the kitchen, but she came to appreciate it when they were feeding eight hungry children. Throughout their life together he made breakfast every morning and prepared weekend meals. Until very recently the best way to visit was at breakfast where you would always be guaranteed a hearty and full meal. Recently when asked what his favorite memory was, Christ responded "sitting around the table with my whole family there”. Always busy doing something, he was a strong man who helped when asked. While in his late 80’s he harvested and stripped cedar logs that would become his daughter Christine’s family room addition. 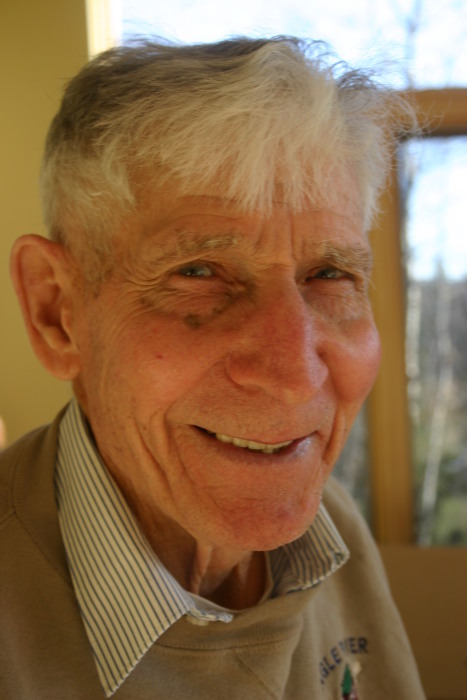 In his early 90’s he helped tear down a farm shed so that it could be recycled and used to make beautiful doors. While In his mid-90s Christ bought a bulldozer and dump truck and then spent weeks (from early morning to evening) helping his son Bob create pasture by removing large boulders. Never complaining, always enjoying the challenge and rarely stopping for a break. A lifelong hunter, every fall Christ would travel to his beloved hunting shack north of two harbors, where crisp fall days of freedom were filled with hunting, hiking, building projects, searching for special wood to use on projects, and hours of camaraderie with his boys and hunting buddies. He loved the outdoors. If he wasn't fishing, hunting, golfing, hiking or cross-country skiing, he and Joyce were piling their 8 children into the station wagon for a Sunday drive or a car trip vacation. After retirement he volunteered countless hours to help build the Lake Superior Hiking Trail. Christ will live on thru the craftsmanship he put into many projects: bird houses, furniture, diamond willow walking sticks, the hunting shack, the Harshaw cabin which he built with lumber he milled and 8 GOOD kids. Christ was born and raised near Stratford, Wi surrounded by a large extended family including 10 siblings, all who would grow to be smart, thoughtful, quick-witted, caring, and independent adults. Work on that family farm set the stage for Christ’s lifetime of purpose, dedication, hard work and quest for adventure and knowledge. Upon graduating from 8th grade, Christ headed to the northwest with a brother. With the support of his Aunt Amy and Uncle Jack he found his way to the mills, lumber camps and orchards of the Pacific Northwest. Stories of this time tell of lessons learned, skills developed and a sense of adventure. He served for 3 1/2 years in the army air corp during world war II as an airplane mechanic, beginning in North Africa, moving thru Italy and north into Southern France before heading home to Harshaw Wisconsin, where he would meet his future wife. In 1950 Chris and Joyce moved to Duluth, Mn where he would spend his working years as a heavy equipment mechanic for Road Machinery and Supplies Company. An obedient and dedicated catholic, Christ had a strong belief in God, was a very active member of St Michaels Catholic Church and a Knight of Columbus. Christ was preceded in death by his beloved granddaughter, Elizabeth Busche; great grands sons, Archer Eckman and Gabriel Busche; his parents; and many of his siblings. Christ is survived by his wife, Cathern Joyce (Simons) Busche; children, Christine Austin, Darby (Gary) Conner, Robert (Ann) Busche, Todd (K) Busche, Kathleen (Frank Jewell) Busche, Keane (Jane) Busche, Kevin (Molly Bradford) Busche, and Joycanne Hoyem; 66 grand and great grandchildren; lots of nieces and nephews who know him as Uncle Chris; and 2 sisters, Josephine & Dorothy. Visitation Will be 3-5PM Sunday October 21, 2018, in the Dougherty Funeral Home, 600 E 2nd Street, Duluth, MN 55805, Visitation will continue Monday, October 22, 2018 from 10AM until the Mass of Christian Burial at 11AM, in St Michaels Church, 4901 E Superior St, Duluth, MN 55804. In Lieu of gifts, please make donations in his name to the Lake Superior Hiking Trail Association or St Michael’s Early Learning Center.